If you like to get your truck dirty, Slaughterhouse has what you're looking for. 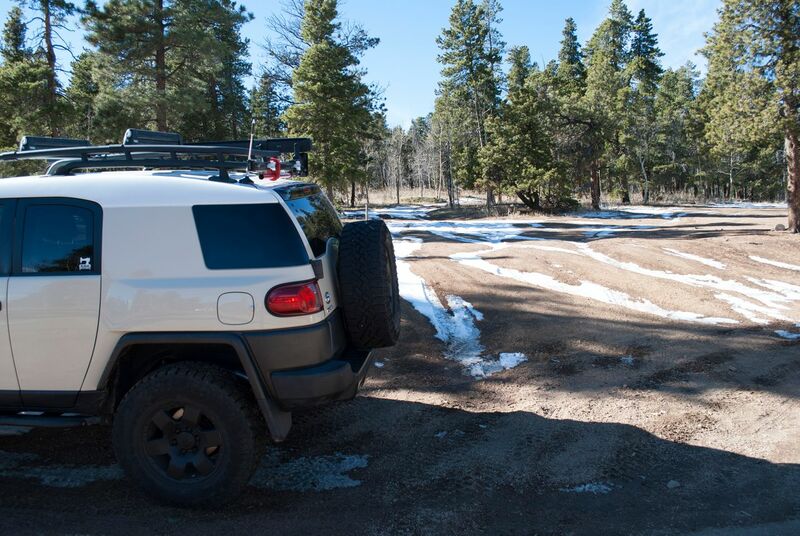 You will find lots of mud holes and spots to flex your suspension along this trail. Located just outside of Bailey, CO, and open year round, Slaughterhouse makes for a good spot to come test new equipment. Leading into a forest in a lower elevation ravine, this route is not a scenic one, with the exception of the aspen groves. It tends to draw larger crowds because of its proximity to the Front Range. The mud holes located off of 101 have been permanently closed, but there are many other holes along 105 to dip in. There is a yellow sign marking the trailhead. Coming from Denver: Take 285 South approximately 35 mi. Turn right at the sign for the Bible Camp "Id-Ra-Ha-Je" on to Park County Rd. 43. Continue straight on 43 6.5 mi. Turn left at Saddlestring Rd. Continue beyond a few residential streets until you see a metal sign on your right labeled Crow Creek 4x4 Trail. There is plenty of room for parking and airing down. This is the start of the trail. 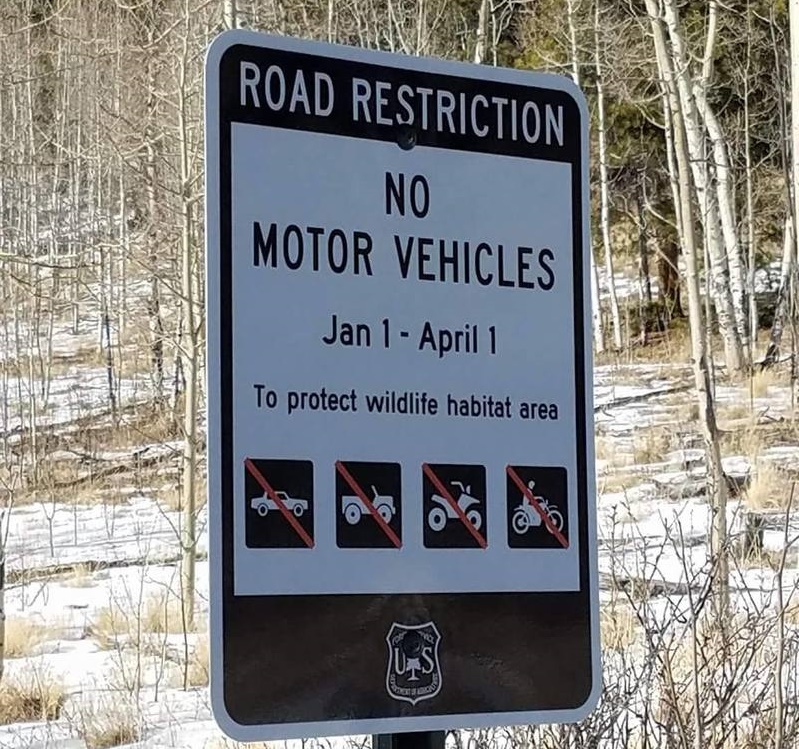 New signs installed late 2016 state no motor vehicles permitted Jan 01 - Apr 01. **Update on closure April 5, 2017, 3:00 PM: According to the South Platte Ranger District, this closure is in effect until May 15, 2017. 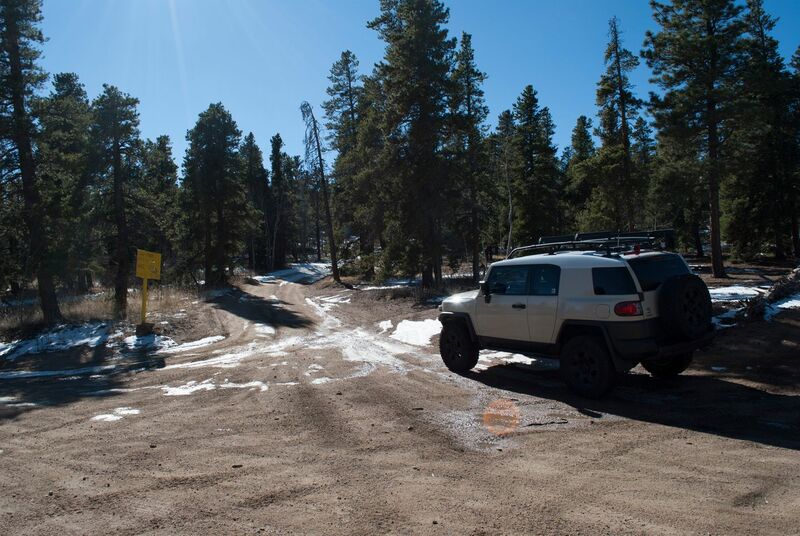 The Gate at waypoint 6 has been closed by the forest service for reclamation of the area. The mud holes back there have been permanently closed. Chris is stationed out of his home office in Denver, CO with his girlfriend and two dogs. 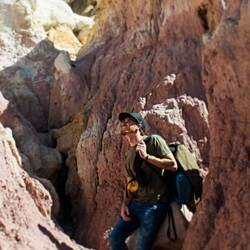 Two of his biggest motivations in life are off-roading and graphic design. How fortunate to be able to combine both interests while working for Trailsoffroad. When he is not on the trail or at the computer, you can find him enjoying all the local music or breweries Colorado has to offer. This trail always offers some fun obstacles combined with some pretty scenic views. At times, there can be a decent number of ATV and side-by-side runners, which makes for a decent amount of dust, but the trail never fails to impress. Watch your tire placement on a few of the downhill rock obstacles, near the early side of the loop. I smacked my rear bumper on a few spots, but nothing too scary. There are typically bypasses for most of the tough obstacles, but still, it's a fun trail to run. Enjoy! Dry had a few stock tacoma that completed the trail. Recommend not having running boards when going through the obsticals. A few more obsticals than last year, 2 new areas to fully flex out your suspension. Pictures don't really do justice to some of the obstacles on this trail. I, for the most part, am a pick the easiest route kind of offroader(my trial rig is my daily driver), but you could put up some decent challenge on a couple of sections of this trail. We drove through in a Stock 2014 JKU Rubicon. One of the mud holes was steep enough that we scraped the rear bumper on the way in. There were a few rocks that we took careful lines over, and once the breakover angle of the longer wheelbase caused a small scrape on the skid plates inbetween the wheels. There was also one section on the way between waypoint 5 and 6 that was very steep and the main trail looked tougher than the bypass, but the bypass, getting back to the main trail was VERY tippy. In other words this is a pretty cool, varied trail, No shelf roads to freak you out, but challenges can be ramped up to test out your line selection and your rigs capability. There are some steep sections, that will be different depending which way you are running the trail, both directions will have some steep ups and downs. We choose to run it the counterclockwise direction which is how the waypoints are setup. Most of the trail is pretty narrow so keep watch for oncoming traffic to make sure you have room to pass. A fun half day Trip from Denver. We left around 9 and were back at 1:30. Love this trail a few spots were a little interesting but overall a great time. Trail is open, mud holes are pretty dry. 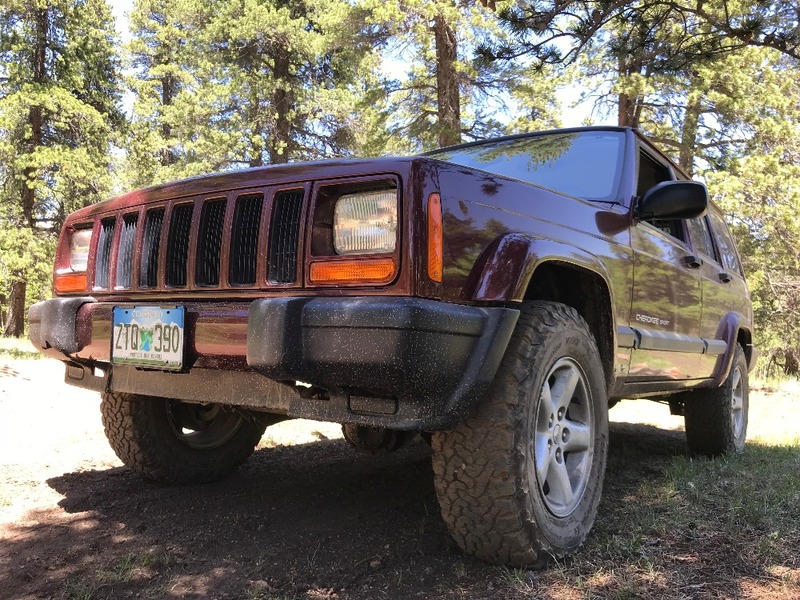 I bought a new rig to build this year and took er out to try before the build actually begins... Made it both directions with stock xj suspension and a set of 28" (235/75/15) BFGs. 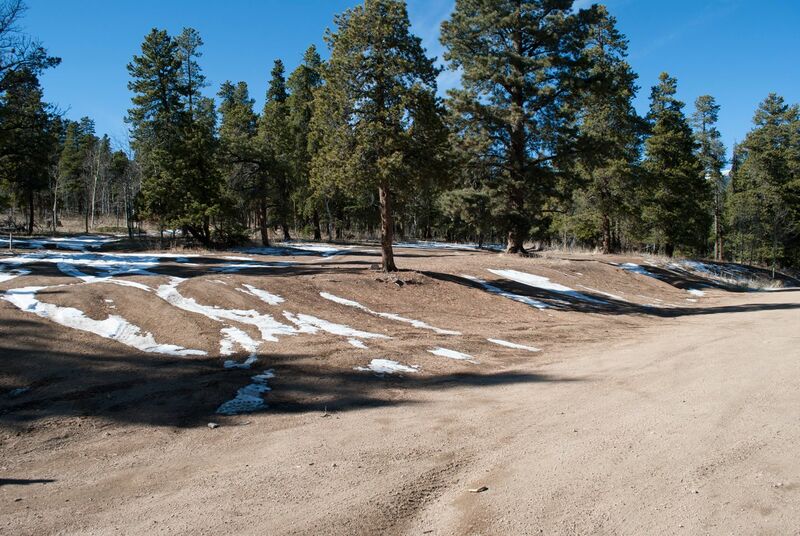 Trail is open per the South Platte ranger district. The mud season closure is not a set dates closure. If conditions allow, the road can be opened, like it is now. Went up there today to test out some things. The forest service has posted a plain white sign that says trail closed April through May even though the gate is open. According to someone I met at the trailhead the Ranger was up the road about a mile handing out tickets. The sign has no official logo and no explanation as to why it's closed. Very little snow, with an emphasis on little. Mostly Rocky and dry. Where there is frozen precipitation it's less than an inch (other than one decent sized puddle). Due to the settlement for trail closures/usage for the PIke and San Isabel Forests, it looks like Slaughterhouse has been closed up for three months during the winter. This sign now exists at the trail. This was a nighttime run on Halloween so we don't have any photos that will really do the trip justice or show anything about the trail. We encountered no snow and only one person got themselves high-centered but easily winched off. Trail is as reported with no significant changes that I can report. We started the morning with 8 Tacomas, and quickly went down to 6 after helping out a stuck vehicle and getting the first two trucks down the hill towards the loop. No one enjoyed this section. 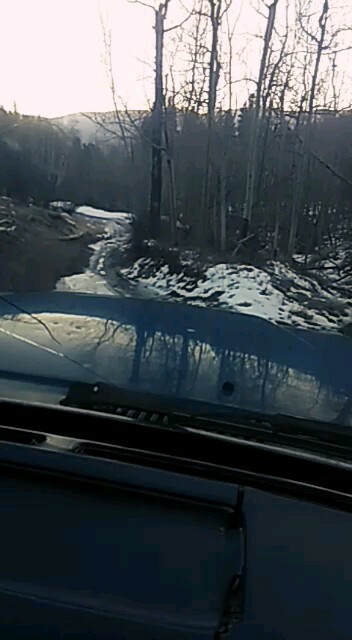 There is a lot of ice on this first section, so keep in 1st gear, 4 low, and stay off the brakes. The climbs between waypoints 2 and 3, as well as 5 and 6 were manageable and did not present a major challenge for any of the rigs, as there wasn't much snow in these spots. There was a mix of snow and mud on the rest of the trail, but no new obstacles since the write-up.